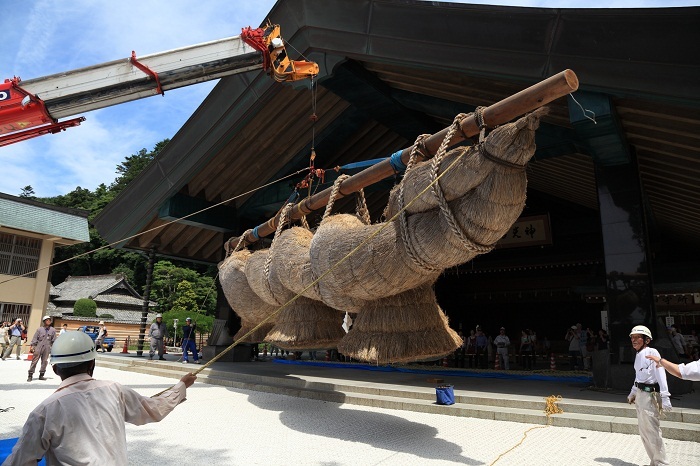 Sightseers who visit the Izumo Taisha Grand Shrine in Izumo city, Shimane cannot help being impressed by the huge straw rope hanging in front of the Kaguraden hall (Sacred dance hall). 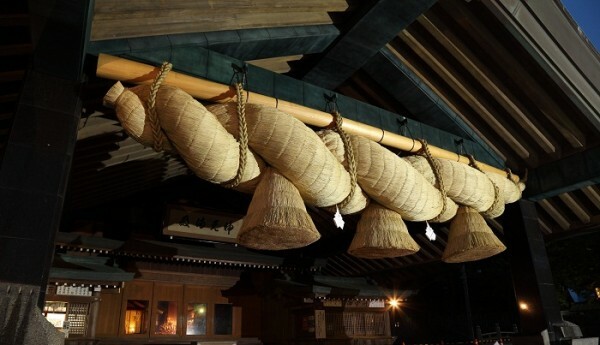 Shinto straw rope, which is called shimenawa in Japanese, can be found at sites deemed holy, especially in most Shinto shrines. 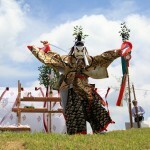 It plays an important role, dividing the space between the sacred area where gods are enshrined and the outside world. Shimenawa is made by twisting dried rice straws together. 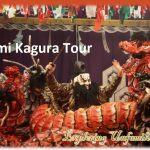 Shimenawa varies in size; Izumo Taisha is said to have the biggest shimenawa in Japan, being 13.5 meters in length, a weight of 4.5 tons, and a maximum of 8 meters in diameter. 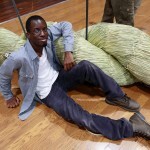 What makes it special is not just its size, but also the direction of the rice straws from which it is made. The rice straws are twisted from the left, which is unusual because most shimenawa from other shrines are twisted from the right. 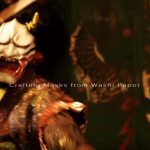 Its distinctive method is referred to as Daikoku-jime, which can be considered suitable for the place which enshrines Okuninushi-no-Okami, known as Daikoku, the deity of happiness and good fortune. 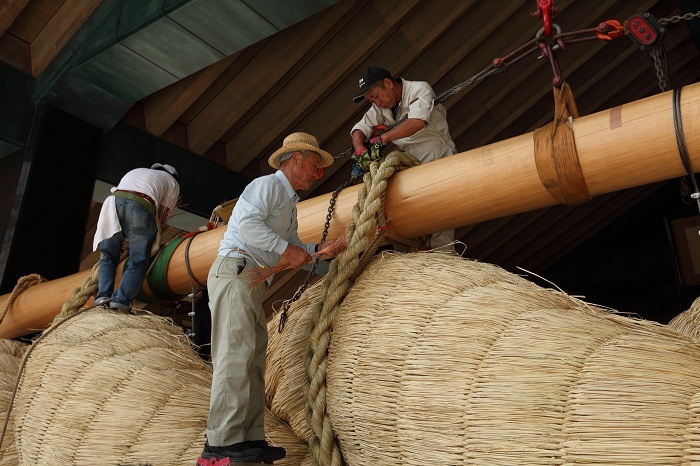 Izumo Taisha’s shimenawa is renewed within every 6-8 years by a volunteer group organized by people in Inan-cho, located in central Shimane. 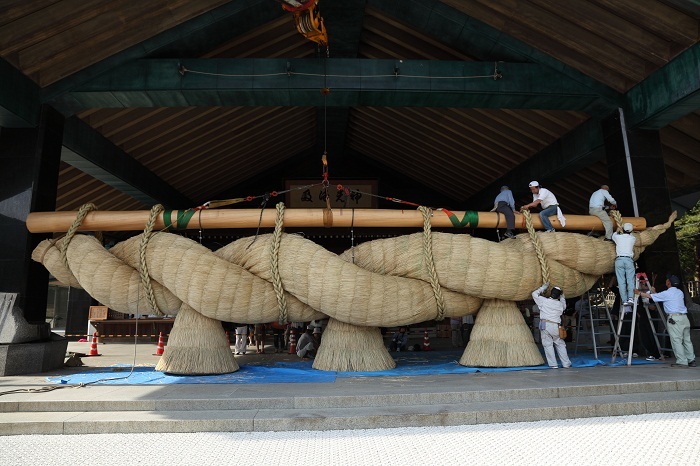 The group first made one for Izumo Taisha more than thirty years ago; it was the sixth renewal. 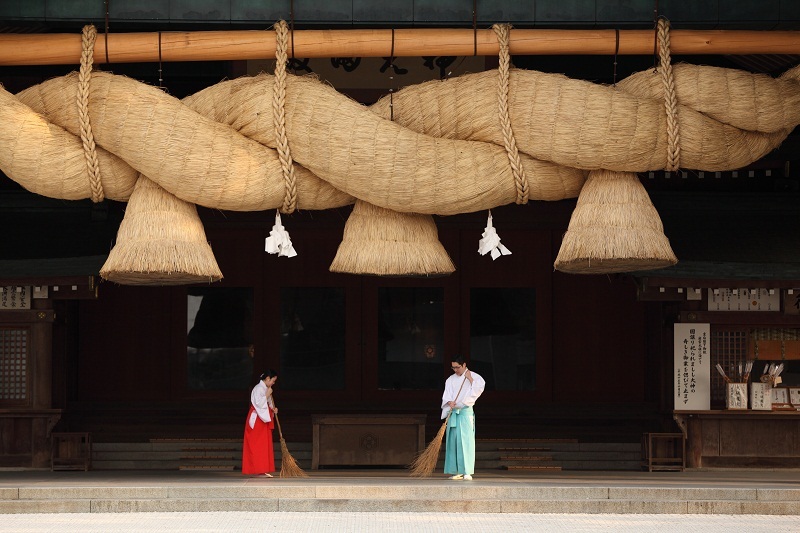 Having finished its four years of important mission, the shimenawa on the Kaguraden was changed in July 2013. The former shimenawa was removed using cranes. 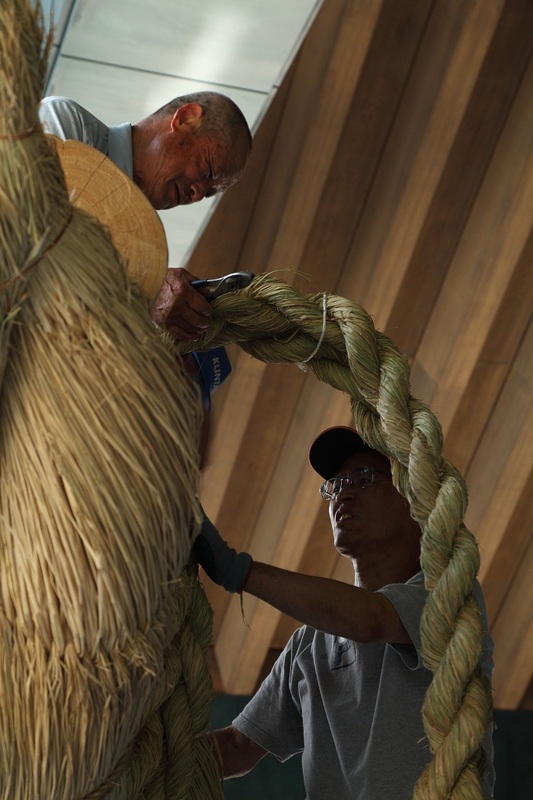 A Straight and resilient cypress tree was used to hang the 4.4 ton shimenawa. 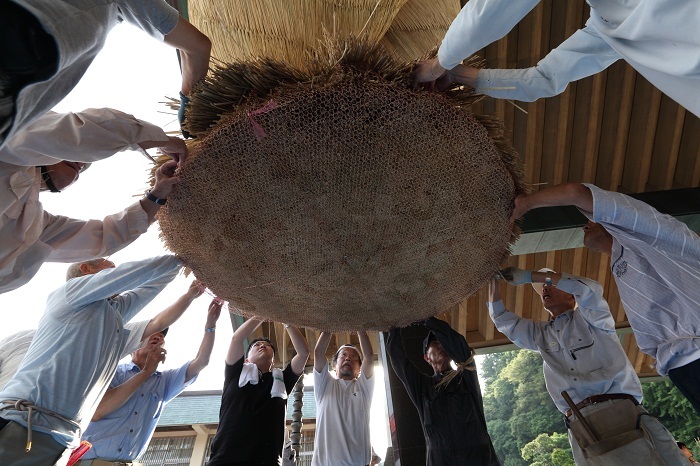 The New shimenawa was almost ready to take over the important mission. To make this gigantic shimenawa, about 3 hectares of rice straw were gathered, and a total of 800 people was involved in its assembly. 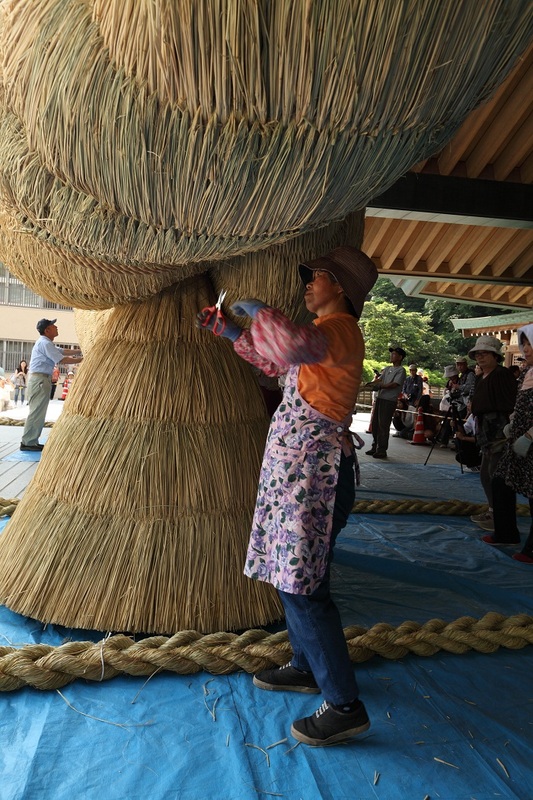 Members were putting the final touches on the shimenawa. 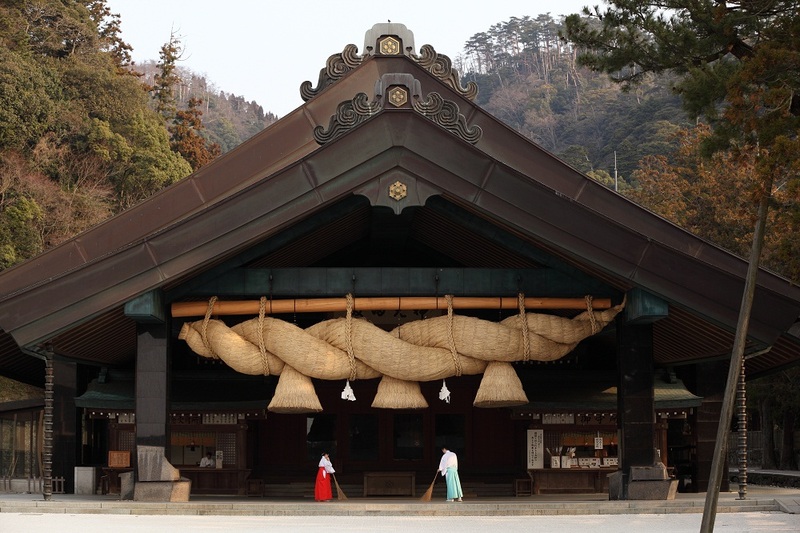 You can see this large shimenawa at Izumo Taisha Grand Shrine in Izumo City in Shimane Prefecture.